Rockland Police Chief John Llewellyn was driving in an unmarked on Saturday when a cruiser when a man in a Ford F-150 pickup truck drove through a red light at an intersection and hit the cruiser’s rear passenger side, according to authorities. 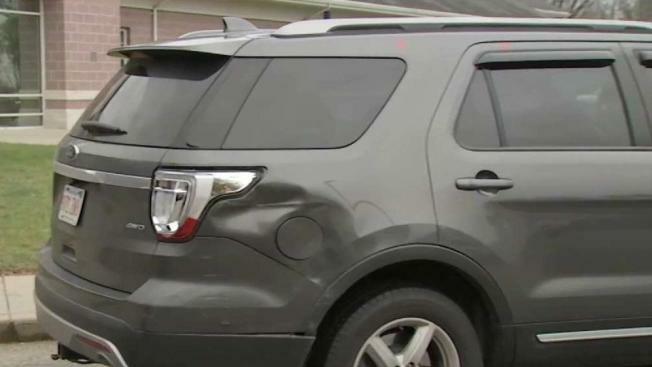 A man who allegedly struck a police chief’s cruiser while driving under the influence in Rockland, Massachusetts faced a judge on Monday. Sixty-five-year-old Rockland resident Richard Cirignano was arraigned in Hingham District Court on multiple charges, including operating under the influence, operating a motor vehicle to endanger, failure to stop for a police officer and speeding. Around 9:30 p.m. on Saturday, Rockland Police Chief John Llewellyn was driving south on Spring Street in an unmarked Ford Explorer cruiser when a man in a Ford F-150 pickup truck drove through a red light at an intersection and hit the cruiser’s rear passenger side, according to authorities. The impact of the crash caused the police chief's cruiser to go off of the road and onto the lawn of a nearby church. Llwellyn said he and his wife Susan had been heading home from a holiday gathering when the incident happened. "We weren’t really injured so that’s the good news," he said. Cirignano allegedly fled from the scene and drove towards Summer Street. After checking on his wife in the unmarked cruiser, Llewellyn went after the suspect's vehicle. "I was more angry than anything at that point," Llewellyn said. The pursuit ended about half-mile from the scene in front of the Rockland Ice Rink, where Cirignano was arrested. "He looked at me and said, 'sorry Mr. Llwellyn,' At that point, I had his license. I knew that he couldn't drive away," Llewellyn recalled. In court, prosecutors asked Cirignano if he had been drunk driving. "I'm not going to answer that," Cirignano replied. "He said he had five or six beers at a friends house in Bridgewater," added his attorney. Cirignano was released on personal recognizance and his license was suspended. He's due back in court in January.